South Cove California is a tourist stop along the coast. Jill Gardner owns Coffee, Books, and More and she just wants to make enough to keep the business open. She is relatively new to the town. It was meeting Miss Emily one day that convinced her to move to South Cove. Miss Emily is an elderly woman who has had a bunch of businesses crop up around her home. Her house needs a lot of work but when she receives a letter telling her the town council is going to condemn her home or force he to sell to a big developer she calls Jill in a panic. Jill calms her down and tells her they will work things out. But before that can happen Miss Emily passes away very unexpectedly. She leaves her home and all its problems to Jill, but Jill thinks Miss Emily was murdered and sets out to prove it even as the killer tries to puts Jill out of business permanently. I knew I was going to love this book and I sure did. Jill Gardner is a great character. She is down to earth and her confidence while shaky at the start continues to grow throughout the story. She also likes food and she features some tasty treats in her shop. There will be even more if Aunt Jackie has her way. Aunt Jackie is a lot like my mom was, do things now and get permission for them later. Jill asks Aunt Jackie to help her with the store as she deals with Miss Emily’s house and all that entails and Jackie took “help” to a whole new level. I was laughing out loud. I was sad that Miss Emily became the murder victim. She was quite a woman and she has a few secrets. I would have loved to spend more time with her. South Cove is also home to Detective Greg King. A handsome guy that just keeps running into Jill. The sexual tension is thick enough to cut with a knife. It is going to be fun watching this relationship progress. The mystery is great too, I just wish I had Jill’s energy, not only does she find out what happened to Miss Emily and why, she also makes substantial repairs to Miss Emily house. Of course she has outside contractors to help but just pulling everything together while painting and decorating was miraculous and a joy to read. There is a lot going on in this book. The pages just flew. 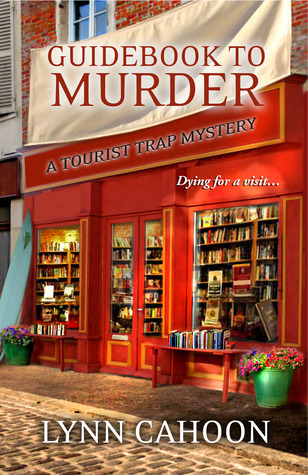 I have been trapped by this Tourist Trap mystery and can’t wait to be trapped again by Mission to Murder coming July 31, 2014. Find out more about Lynn Cahoon on her webpage here. I have thoroughly enjoyed your reviews. They are concise but don’t give away the ending.